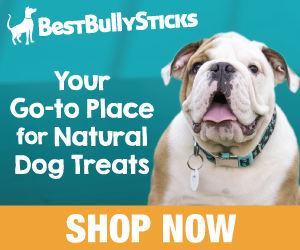 There is no doubt in my mind that if you are reading this article that you love your dog and are interested in giving them the best care possible. With that in mind I thought I would write about the benefits of bone broth for dogs. 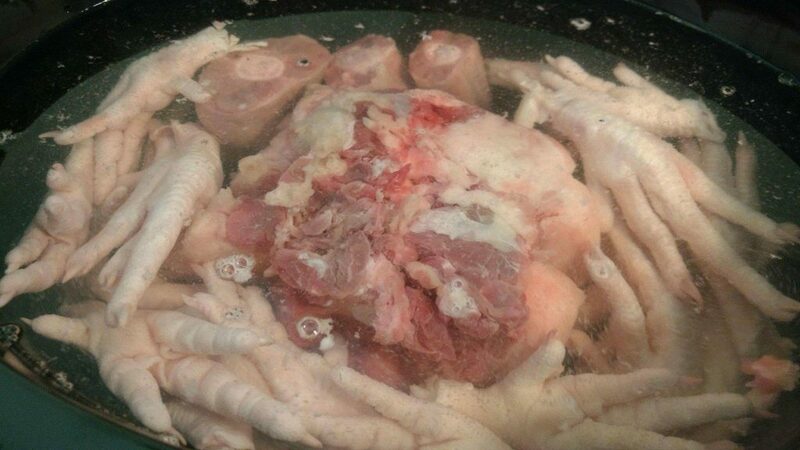 Bone broth is the nutritional rich gel that is left after you slowly cook down marrow bones and bones that have a high percentage of cartilage with them such as turkey or chicken necks, chicken feet, ox tail or large joint bones. 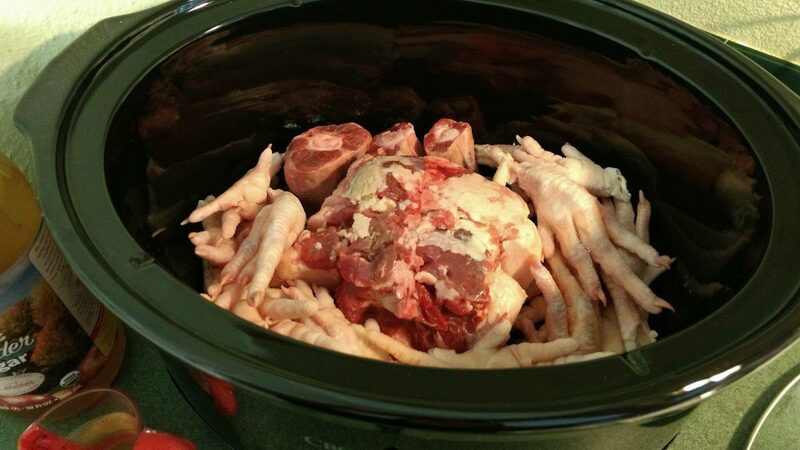 Slow cooking these bones with an acid such as apple cider vinegar pulls the nutrients and minerals from the bones and basically melts down the cartilage to make it available for your dog to absorb the wonderful abundance of its healthful benefits. The largest vital organ in your dogs body is the liver. The liver is responsible for clearing the toxins from the blood and acts as a storage vessel for vitamins and glycogen. It creates the bile used to aid digestion and manufactures the proteins needed for blood clotting. Because the liver can store and filter toxins as well as important vitamins it is essential to provide your dog with the best liver support diet you can find, this is where bone broth comes in. It is believed to aid the liver in detoxifying and storing vitamins and minerals. However, It is not recommended for dogs that already have liver disease. Because cartilage rich bones are used for making bone broth the gelatin that forms when its done is believed to contain glycosaminglycans especially the well-known glucosamine. It also contains chondroitin and hyaloronic acid and all are well-known for their hormone like effect that allows the cells to create collagen in the joints and tendons. When your dog is not feeling well or just getting back to eating after being sick bone broth is a great supplement to get them eating again. It is great to use as a first food after an illness because it is gentle on the digestive tract even soothing to it and can be used to transition your dog to solid foods again. And sadly, sometime in older dogs it may be the only thing you can get them to eat in their last few days. This is the simple recipe that I use for making bone broth, there are many variations of this on the internet so use whichever one you are most comfortable with. I make mine in a crock pot because it has to simmer for so many hours I just feel the crock pot is a safer option than cooking on the stove. There isn’t any strict recipe to follow. 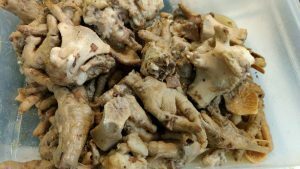 You just take raw joint bones such as knuckle bones or beef or uncured pork hocks (do not used “ham” hocks you don’t want the salt and chemicals found in ham), turkey, duck or chicken necks, chicken feet and marrow bones. Place them in the crock pot put in enough water to completely cover the bones and add apple cider vinegar (I usually use Bragg’s Raw Apple Cider Vinegar but the last time I made broth I used an organic unfiltered brand that I found) about 3-4 Tablespoons for a large crock pot. I cook mine on high until it boils maybe 2 – 4 hours (depending on your crock pot it might take a shorter or longer time) then reduce to low to medium and let cook for about 24 hours. Beware your house will smell so don’t make this before company comes over. I have noticed that the more vinegar you use the longer you will need to cook it so the smell of the vinegar is less noticeable. 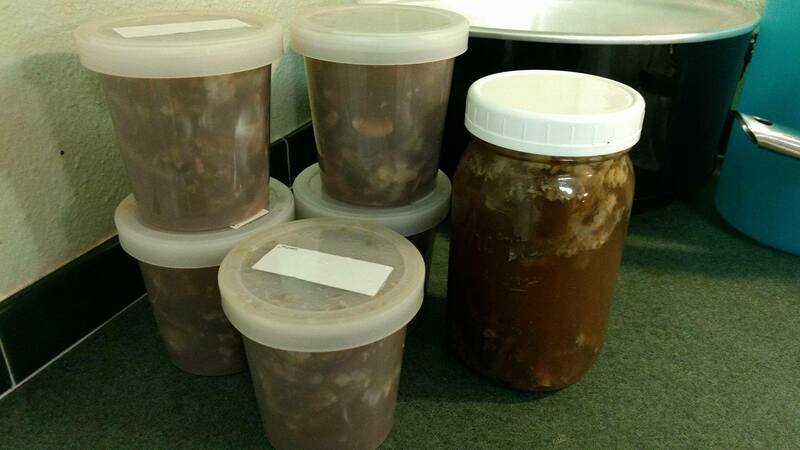 Let it cool, strain out the bones and discard them (Do Not Feed Them)Put in freezer containers or use ice cube trays to freeze for single portion sizes then put broth cubes in freezer bags to store in freezer. You can add some vegetables to it also if you like, maybe carrots, green beans or peas. The pictures are of the most recent batch I made, I added green beans in the last few hours. Bone broth has been used for hundreds of years. There is a long hystery of belief in its health benefits to both humans and animals. I don’t believe there is one miracle food that will cure all ailments but some people have believed that bone broth comes very close. That being said, Don’t rely on it as a sole source of nutrients it should be used as a supplement to your dogs already good diet not replace it. Use it as a topper for their daily meals or mix it in if you freeze homemade meals ahead of time. I hope you have found this article helpful and please leave me any questions you have or just leave a comment below, I try to answer all inquiries within 24 hours. Read you post and it was very informative. My wife and I are thinking about getting a dog at some point but are having a hard time on what kind of dog to get. She wants a small to medium dog and I like the husky, however I was told they make a lot of noise. This post is good knowledge to have. Hi Eric, thanks for reading my article, I have heard that huskies can be very vocal as well. My dog is about 48 lbs so he’s just the right size for me, he’s still small enough he can sit on the couch beside me and he’s big enough that someone would think twice about messing with me if we are out for a walk. It’s a big decision getting a dog, it will part of the family for several years so take your time in picking the right one. And thanks again for visiting my post. Your website is unique and fun-loving. I can’t imagine a more wonderful site dedicated to animal health. I learned how bone broth is important to dog health. It certainly makes since, I use it to make soups, sauces and stews regularly. You have some wonderful topics. I really appreciate your research knowledge and expertise addressing animal care. Making pet foods including baked goods and treats have always been an interest of mine, and some day I plan to get involved with the learning process after some time invested in extensive research.Your website is a pleasure to visit and I am looking forward to following you to learn more.